The campaigns all claim they hate this trend, but I’d take that with a grain of salt. Sure, campaigns lose some control when outside groups are spending so much money, but they also gain deniability. Outside groups have more freedom to air genuinely vicious ads — something we’re likely to get a big snootful of in the general election — and I’d be surprised if most campaign poobahs didn’t secretly think that’s a pretty good tradeoff for the loss of message control. Here’s another interesting tidbit from the report: Although overall spending is down, the number of ads purchased is about the same. This means that the average cost of an ad has gone down from $700 in 2008 to $400 this year. I really have no idea why this is. 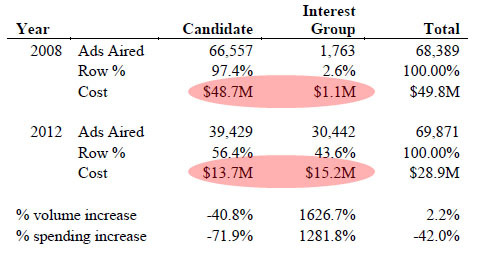 Recession or not, I’m sure ad rates haven’t fallen that much, which must mean that both campaigns and outside groups have changed their ad buying strategies. Maybe shorter ads. Maybe ads in cheaper time slots. Beats me. But the data is only for national cable and broadcast buys, not local cable buys, so it’s not due to a sudden surge of super-targeted local ads. Also, Romney is absolutely swamping Gingrich in Florida, buying 60 times as many ads as Gingrich. No, that’s not a typo. 60 times. More data at the link.